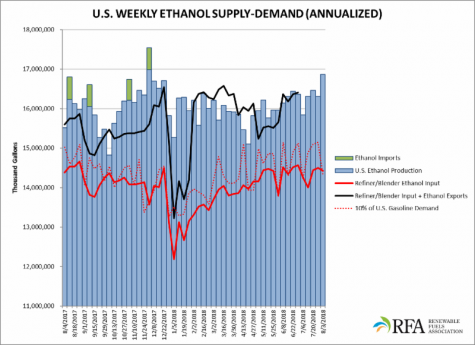 Ethanol production almost breaks industry record : Biofuels Digest | Alternative Energy news. We provide you with the latest breaking news and videos straight from the Alternative Energy industry. In Washington, D.C., ethanol production rebounded to an average of 1.100 million barrels per day (b/d)—or 46.20 million gallons daily, ballooning 35,000 b/d from the week before, according to government data released and analyzed by the Renewable Fuels Association. This marks the second-highest weekly volume produced by the industry, coming in at just 8,000 b/d below the record set last year on Dec. 1. The four-week average for ethanol production moved to the highest volume in 32 weeks at 1.075 million b/d for an annualized rate of 16.48 billion gallons. Stocks of ethanol were 22.9 million barrels. That is a 4.1% increase from last week, a substantial jump that expanded reserves to a 20-week high. There were zero imports recorded for the 35th week in a row. Average weekly gasoline demand faded, receding 5.4% to a four-week low of 392.5 million gallons (9.346 million barrels) daily. This is equivalent to 143.27 billion gallons annualized. Refiner/blender input of ethanol eased 0.5% to 941,000 b/d, equivalent to 14.43 billion gallons annualized. The ethanol content in gasoline supplied to the market averaged 10.07%, up from 9.58% the previous week. Expressed as a percentage of daily gasoline demand, daily ethanol production popped to a 23-week high of 11.77%.